Hammin, he is indeed out injured - a huge loss for Sabella. morty...he admitted to diving..end of discussion..
A Dutch win makes all of the above happen. If he's out today, Hammin, hes unlikely to make the final should Argentina get there. The only reason people don't like Robben is because he is a self-admitted sneak. What position does Kuyt play today? Seattle, he'll play wide right, getting back to defend and then countering forward. Basically, Dirk Kuyt plays everywhere. If Netherlands stick to their gameplan of counterattacking footy, i would think argentina would have problems keeping up with robbens pace.. Demichelis isnt all that fast. Honestly though, i would prefer watching a netherlands vs germany game in the finals. Argentina hasnt really played that great and their games have been kinda draggy. Kuyt plays all the positions. 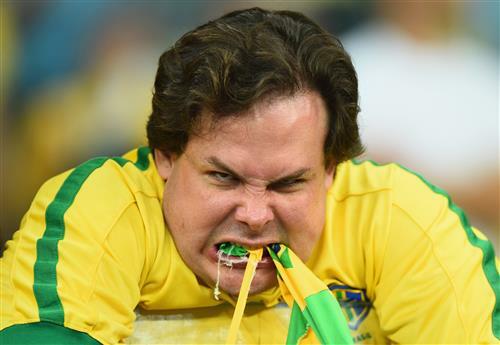 Tom, I just had this crazy dream that Brazil lost by 6 goals in a WC match on Brazilian soil. elephant in the room.... does Messi show up today??? I am hoping for at least an extra 30 minutes. Who's the ref today? The only reason it shouldn't be the one, the only, the man, the myth, the legend, Officer Howard Webb, is if he's saved for the Final. Bashel, it's Cüneyt Çakir who will officiate today. Kuyt hasn't looked too bad in the tourney, had me thinking he could still make it in the PL. With Di Maria out, I don't see Argentina winning this game. All the Dutch have to do is keep a lid on Messi. Higuain and Lavezzi can't create goals on their own. 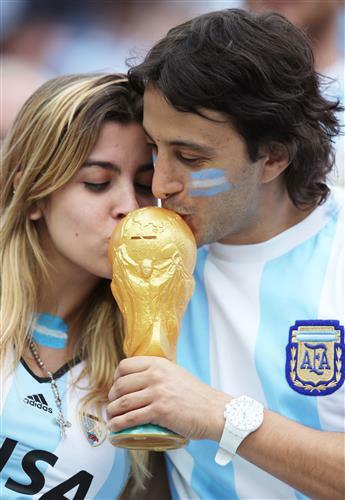 Will Argentina taste glory today? I wonder if Netherlands going to extra time against Costa Rica will play any part in this match. So far in this tournament, winning a game in extra time has not made a significant impact on the team's following performance. Why is Howard Webb so good and respected? Since someone brought it up Tom, who do you expect to be given the whistle for the final on Sunday? Lots of Webb talk - from watching him in England, he usually gets calls right, and tends to be trusted for the big games. He is also excellent at 'managing' a game, meaning when he officiates, game usually flow well. Oh no, please no more sad fans hugging replica trophies. That poor old man nearly had me sobbing at my desk. Bram, what about this fan? Short answer: Webb doesn't kill games and he doesn't boot many calls. Webb- Top Red! Clattenberg - Referee,Leader,Legend! Kuyt, is that strains of Costello I hear? Mac, make sure you're back for the third-place playoff and final!